Why Use Hazard Reporting Forms in Aviation Safety Programs? Web-based hazard reporting templates or forms are key to healthy performance of aviation safety management systems (SMS). Safety cultures depend on well-designed, user-friendly tools to report and manage reported safety concerns. As you can see, these options are not ideal. The most convenient way to report safety concerns is by using email hazard reporting options. In this case, your SMS will need moderately sophisticated hazard reporting software. How email reporting works is that your SMS database uses "scheduled tasks" to read the configured safety email account at predefined time periods, such as every five minutes. Whenever the "scheduled task" discovers a new message, the task pulls the new email into the SMS database and notifies configured safety team members of the new safety report entering the risk management system. If you need more sophisticated data gathering techniques, then you should opt for flexible Web forms that are designed to capture specific data elements needed to initiate risk management processes. Employees that don't have access to the SMS database. Email safety reporting is preferred over paper-based reporting methods. You cannot rely on all stakeholders having access to paper-based reporting forms. What you "can" count on is that most people today have emails and a way to send emails. You should not rely solely on email safety reporting for the SMS; however, it perfectly supplements your main method of receiving safety reports. Email reporting is the most convenient reporting method for stakeholders and "convenience" is a good thing when you consider the alternatives to having long, unfriendly reporting forms that tarnish your safety culture. In these next sections, we will discuss hazard reporting form design principles that safety managers MUST consider when burdening employees and stakeholders with poorly designed reporting forms. 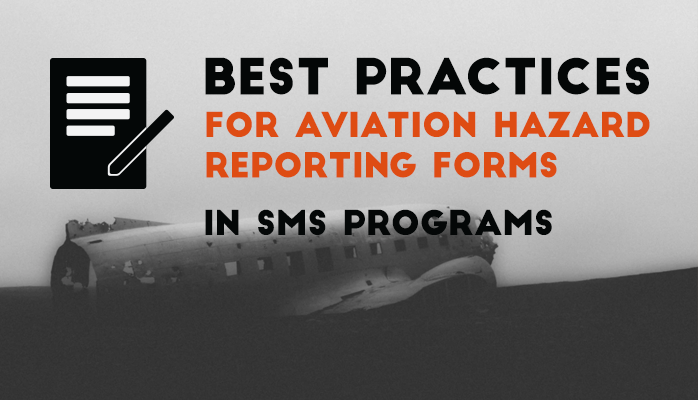 We will show how properly designed reporting forms will increase employee participation in aviation SMS programs and increase acceptance of the SMS. "Hey boss, I'm acting in good faith here and fulfilling my SMS responsibility. I saw something that may concern management." "What in the hell is this? OK, I'll do this once, but don't expect me to go through all this work the next time." Any safety manager can see that this scenario is both realistic and you may have experienced it yourself. Safety culture is damaged by poor reporting form design. Are safety reporting forms hurting your safety culture? Why Safety Managers Need to Learn about Hazard Reporting Design? We are routinely asked to create custom hazard reporting forms that integrate with operators' aviation SMS database. In most cases, these custom reporting forms were designed by safety managers that want to capture every possible data point imaginable. Poor hazard reporting culture is often the result. I don't want to keep going back and forth with the reporter for more information. Sound familiar? What you are saying is that you either don't care about your safety culture, or you have not given any thought as to how your 300 field safety reporting form affects safety culture. I'd rather make it easier for my safety team to do their job and let the employees/stakeholders suffer from abusive reporting forms that captures every possible data point imaginable. Don't worry about capturing every possible data point. I've been creating safety reporting systems for aviation SMS for over a dozen years. In real life, safety teams only occasionally need to go out and get more information. Only occasionally do safety teams need more information from reporters to investigate reported safety concerns. If you are encouraging employees to report every close call, as you should, don't make employees suffer from your poorly designed safety reporting forms. You know the result. Your safety culture may already be suffering. Don't make it worse. How Many Fields Are Best for Hazard Reporting Templates or Forms? You may be wondering how many or how few data points you should require with each hazard reporting template? We have no perfect answer when it comes to how many fields reporting forms should contain, but the best balance should be to collect only data points you really need. In most cases, follow-up investigations will yield more information. What happens if I forget my password to the SMS database or safety reporting system? Will users need offline reporting capabilities? What happens when the safety report submission fails? Any backup options? How is Internet speed and reliability where most employees operate? on older, slower computers, IPads, tablets and smartphones. In short, the more fields you add to reporting forms, the more friction (work for your reporters) and consequently your reporting culture suffers. Many times when I see a long form, I give up immediately and refuse to fill out the form. One example is when we take our three-year-old daughter to get a doctor's checkup. When their forms are too long, I become exasperated and hand the form to my wife to fill out. She is more tolerant than I. There is a fine line between having too few fields and too many. If you find that you have to continue hunting down reporters for more information, you may want to add a few more fields. The best way to determine what works best for your SMS' safety reporting system is to test it. First try the minimalist approach. When the safety team encounters too many problems with insufficient data points coming into the system after a sufficient amount of time passes, then you can make adjustments. Otherwise, you will be hurting your safety culture immediately and damaged safety cultures take considerable time to repair. What is a "sufficient" amount of time to test each iteration of the reporting form? Six months. 2) Reduce friction and frustration. Make sure safety reporting forms load quickly and don't hang. When possible, make hazard reporting forms available for all web devices, such as iPhone, iPad, Android and other Web browsers. 3) Notify users immediately that their safety concern has been received by the safety team. Feedback is important to improving your reporting culture. Employees don't like to be left wondering if the safety team actually received the report, or whether the report went into a black hole, like so many paper-based reports. Email notifications from the SMS database are a best practice. If you have a modern SMS database, these email notifications can be sent out automatically. 4) Allow users to follow up or track their report. Safety reporting cultures are enhanced when employees can track their reported safety concerns. Just like a UPS or FedEx tracking number, employees develop an enhanced sense of confidence and trust in the SMS knowing that they can track their reported concerns whenever they like. The truth is that when employees know that they can track their reported safety issues, they seldom do it except in very good safety cultures. Otherwise, employees may not be interested. They fulfilled their responsibility to the SMS, now it is time for the safety team to put the issue through the risk management process. 5) Don't be afraid to make changes to hazard reporting templates. An aviation SMS is a living, breathing, evolving entity. Don't feel that changes mean "failure in initial design." Aviation SMS change, just as their requirements change due to constantly changing environmental pressures. Modern SMS databases are more flexible than point solutions or white-label software packaged by SMS re-sellers. An SMS database is the preferred technology for managing SMS data. What Is an Aviation Safety Database? The design of your SMS' hazard reporting templates or forms will determine how many reported safety issues your company will receive. Most reported safety issues don't require 50 fields of required data points. We must think of the end user's experience when designing reporting forms. In most cases, less is more. Most sophisticated aviation hazard reporting systems have the ability to easily modify reporting forms. If you need some help, give us a shout. SMS Pro has many predefined safety reporting forms in the SMS database. You may be interested in seeing this best-in-class aviation hazard reporting solution in action! Does it look like we are a good fit? Our SMS database allows you to manage ALL SMS requirements in a single system.